Double the Fisticuffs, double the fun! "Shall we compare the speed of our attack rushes?" When two characters both try to punch each other at the same time and knock fists, we call that a Punch Parry. When two engage in a duel of Rapid-Fire Fisticuffs and struggle for dominance? That is what this page covers. Very common in shonen action series. This comes in two common variants, using mostly straight punches originating from a single point of origin and then simply branching off via modifying the position the outstretched arm ends in, or throwing out lots of curved, "haymaker" type punches which usually cover a greater "field" of potential areas to hit. The Trope Namer is the video game God Hand, where two characters trying to use the "pummel" attack on each other results in this. It appears in most other titles made by PlatinumGames from that game onwards. A lot of Shonen Fighting Series have them, but Fist of the North Star probably made this trope, with Ken vs. Raoh's fights being some of the most epic variations of these ever, and Dragon Ball popularized them. Fist of the North Star mainly uses the "straight" variant. JoJo's Bizarre Adventure has a lot of rapid punching, but tends to more often be one-sided, as really only a specific archetype of Stand favors direct combat. Still, one of the most iconic scenes of the series is Jotaro's Star Platinum ("ORA ORA ORA ORA ORA") and Dio's The World ("MUDA MUDA MUDA MUDA MUDA") sparring fists, which is part of a general Fearful Symmetry the two had going. As the story goes on, the series mostly uses the "curved" style of punches. 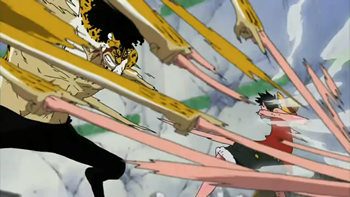 As pictured above, One Piece includes a variant of this trope in the fight between Luffy and Lucci. At one point, they exchange blows repeatedly, and Luffy uses Rapid-Fire Fisticuffs, but Lucci uses Rapid Fire Claw Pokes Of Doom. Luffy's boxing match with Foxy is a more straight example. Luffy engages in several more Pummel Duels later in his journey, such as against Byrnddi World in the 3D2Y special, and against Don Chinjao in the Dressrosa Tournament. Yoruichi vs. Soifon in Bleach, at least for the first half of the battle. Played for Laughs with Ichigo and his father, Isshin. Cure Marine vs. Kumojacky in the Magical Girl Warrior series Heartcatch Pretty Cure. The completely asymmetrical duel is made even more jarring because Cure Marine, in mundane life, is The Fashionista Erika. Happens in other Pretty Cure series as well. Kenichi vs Odin via seikuken vs seikuken. In Mobile Fighter G Gundam, followers of the School of the Undefeated of the East do this as a greeting. "LOOK! THE EAST IS BURNING RED! " Medaka Box: Medaka has to fight Takachiho, someone who has Super Reflexes, engaging in this. Zenkichi also engages in a kicking version of this with a brainwashed Medaka. Vivio and Miura of Magical Girl Lyrical Nanoha Vivid, being Friendly Rival Kung Fu Kids, engaged in quite a bit of this in the earlier parts of their match, before they started pulling out their more advanced techniques. Naruto: Kaguya Otsutsuki and Naruto with Ashura's, one of Sages Sons, Chakra get into one of these using chakra arms in chapter 680. My Hero Academia: All Might gets into one of these with Nomu, an artificial villain designed specifically to fight him and withstand his attacks. All Might, already at the limits of his power, pushes beyond those (PLUS ULTRA!!!) and pummels Nomu until his ability to absorb his punches gives out before sending him flying. One of the more ridiculous examples is Keijo!!!!!!!! where this is shown be doable with butts of all things. Ip Man 2 has Ip versus Master Hung, as well as both of them, not together though, doing this with the Twister. Juken Sentai Gekiranger in Training 5, Ran and Kademu engage in this trope during their final battle. This carries over into Power Rangers Jungle Fury. The final round of Rocky Balboa has both sides trying to land as many punches to the other as possible. The climactic duel of The Dark Knight Rises has a brief bit of this between Batman and Bane. Bane really is very fast for such a heavily-built guy. Journey to Chaos: Tiza and Hailey's duel in Mana Mutation Menace starts with contests of technique but ultimately becomes a slug fest. Neither bothers ducking or dodging but only punching the other as hard and fast as possible. God Hand, as the trope namer description indicates, tends to have these often when you fight Azel, Gene's Evil Counterpart. God Hand also has the same thing with kicks while fighting Azel. The battle between Jack and the Final Boss in MadWorld, which is a Shout-Out to the above God Hand example. It's also found in Anarchy Reigns, the pseudo-sequel to the game when two characters enter Rampage Mode and attack each other. And seen yet again in Bayonetta, between the title character and her rival Jeanne. With giant fists made of hair no less. Done another time in Vanquish in Sam Gideon's Fight against the Leader of the Order Of the Russian Star. It's worth noting that Sam performs this against two mechs under the Big Bad's control simultaneously. It can also be found in the fourth and final fight with Prince Vorkken in The Wonderful 101 with Wonder-Red being the other participant. Now here's the kicker, each side has the ability to link their 100 allies together into various forms of huge weaponry (swords, hammers, etc). Wonder-Red's special morph is a fist... you figure out the rest. Fist of the North Star: Ken's Rage has them during most boss fights with other martial arts users. This happens in the Dragon Ball Z: Budokai games whenever two characters match blows. After a short period of time, whoever has the advantage will break the duel and get a free shot at the loser. Dragon Ball Xenoverse does the same but it ultimately doesn't matter. Neither fighter gets a hit in but it does at least prevent the one with less hit points from being hit with another combo. Asura's Wrath has one in the form of Asura and his Old Master Augus. What makes this especially impressive is that the two armed Augus is able to match Asura blow for blow, when he has all SIX of his own arms out. Arms with Rapid-Fire Fisticuffs that can become so powerful they can destroy objects the size of planets. The way it plays out is definitely a Shout-Out to the Clover Studios/Platinum Games style of pummel duels, and it's taken up to eleven with Cross Counters added in for extra oomph. And all this is happening to the sound of the New World Symphony. Asura later gets one with Chakravartin. This one is especially spectacular considering the latter has even more arms than Asura. It happens again in the finale of Lost Episode 2, between Mantra Asura and Oni. Jojos Bizarre Adventure All Star Battle has these when two Stands do Rapid-Fire Fisticuffs on each other at once, playing out similarly to the Dragon Ball Z: Budokai example above. This can also be done by Jonathan Joestar, who is the only non-Stand user who can keep up with them. The original Capcom fighter had this, too. Now Super Smash Bros. allows players to do this with a Little Mac vs. Little Mac match. Also, in Corrin's character trailer , Corrin does so with Toon Link (though, funnily enough, Toon Link's doing so with his taunt). Skullgirls has Big Band, who can pull Rapid-Fire Fisticuffs out with his "TUBA TUBA" enhanced Blockbusters. Two Big Bands can actually trade TUBA TUBA supers, though who wins will depend on health, initiative, and who started their TUBA TUBA attack first. Death Battle occasionally has this happen against unarmed combatants. Balrog vs. TJ Combo found each meet causing a Kung-Fu Sonic Boom until the boxing ring was on the edge of collapse. Jotaro Kujo vs. Kenshiro had the pummeling accompanied by a similar clash of ORAORAORAORAORA vs. ATATATATATATATA. In the Steven Universe episode, "Ocean Gem", Garnet and her water clone go berserk on each other with punches galore. The Powerpuff Girls "Stuck Up, Up, and Away" is a homage to Dragon Ball Z complete with the Nonchalant Dodge that Super Saiyan Trunks did. The Mixed Martial Arts bout between Don Frye and Yoshihiro Takayama. The two guys bludgeoned each other beyond human comprehension. Typically less bloody is when two house cats swat at each other rapidly to make the other go away.